Pasta is an economical way to feed your family. Pasta helps stretch your meals and food budget. Most boxes of dried pasta cost less than a few dollars, sometimes less than a dollar when on sale. 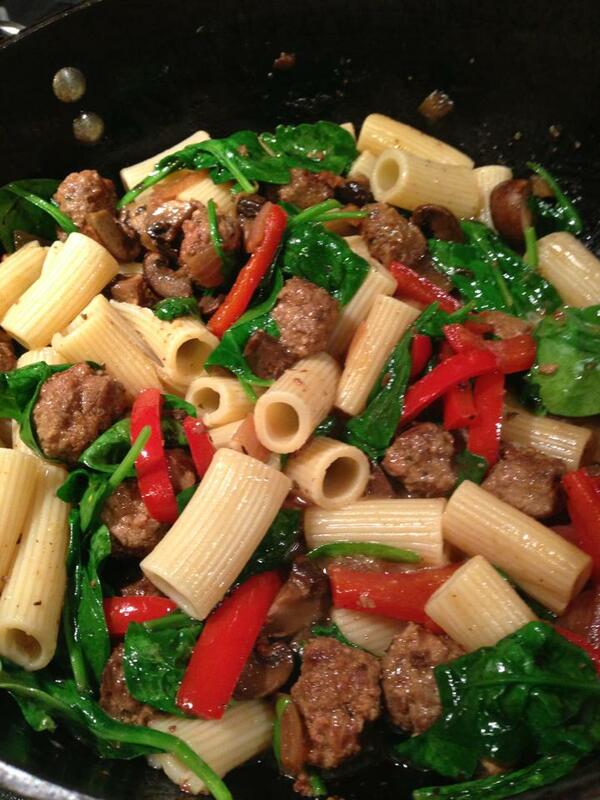 My Hearty Rigatoni with Italian Sausage, Spinach, Mushrooms, and Bell Pepper is a great way to spice up a regular weeknight pasta meal. Just a small amount of Italian sausage will add great flavor to this dish. You can always add more. Use chicken or turkey sausage for a lighter dish. Or you can use mini-meatballs so maybe your kids won’t notice the spinach. Lean ground beef can stand in for the sausage, if you prefer less spice. 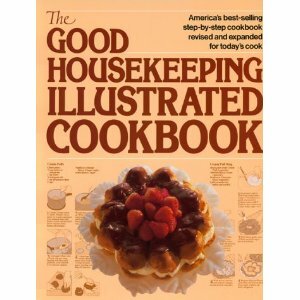 I’ve used ground lamb which is a different, richer taste and a treat (my husband loves lamb). Ground turkey or chicken work well, too. And there are a number of gluten-free pastas you can substitute that will taste just as good if you can’t eat gluten. If you’re not a fan of mushrooms, you can omit them. 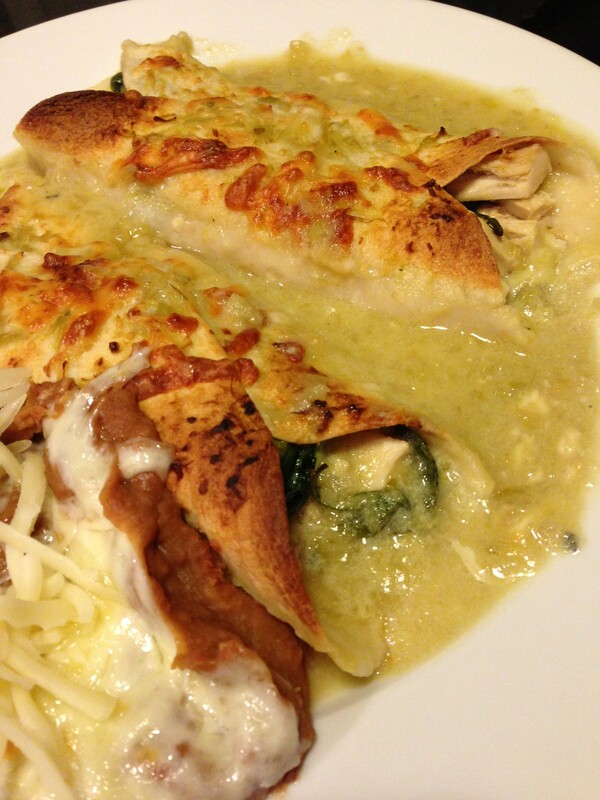 Adding some sauteed squash or eggplant is another option. 1. Cook rigatoni pasta to “al dente” in a stockpot of boiling water while preparing the other ingredients. 2. Heat the olive oil in a saute pan over medium heat. 3. Saute the Italian sausage in the olive oil until browned, breaking it up into bite-sized pieces. 4. Add the onion and bell pepper to the sausage mixture and continue to cook until the onion and pepper are soft and slightly browned. 5. Add the garlic and saute 2 minutes. 6. Add the mushrooms, wine, and chicken broth/stock. Simmer for 5 minutes or until the mixture is slightly reduced. Add the spinach and basil and stir until the spinach wilts. 7. Add 1/4 c rigatoni pasta water to the sausage mixture, and then drain the rigatoni well and toss the rigatoni with the butter. 8. 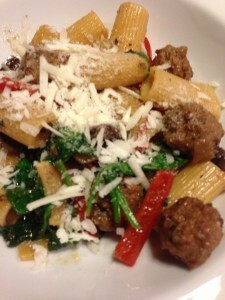 Combine the rigatoni and the sausage mixture and season with salt and pepper. 9. Divide the rigatoni mixture amongst 4 plates. 10. Sprinkle with shredded Parmesan cheese, if desired. Serves 4 as a main course. Offer toasted garlic bread if you wish. A tomato salad with my Tarragon Balsamic Dressing or Low Fat Blue Cheese Dressing is a great side dish. 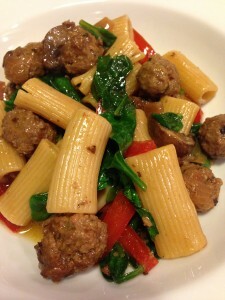 Variations: Can use regular ground beef or ground lamb instead of the Italian sausage. Substitute sliced pre-cooked Italian sausage links instead of the ground Italian sausage. Add more sausage if you are a sausage lover. Use gluten-free pasta if gluten causes issues. To lighten this dish while still using sausage, use chicken or turkey sausage or even spicy tofu. Omit the Parmesan cheese and the butter.